Building equity that you can tap into for a loan is often touted as one of the main benefits of owning a home. This loan can be used to pay for everything from major home improvements to a child's college education. How should you use a home-equity loan? These are some of the best ways. Homeowners have long used home equity loans to fund big home improvements such as kitchen remodels or master suite additions. And they can be a smart use of your home equity dollars. Just don't expect a complete return on your investment if you plan on using these improvements to help sell your home. While a newly renovated kitchen or updated master suite can make your home more attractive to potential buyers, and could help you sell your home faster, don't expect a dollar-for-dollar increase in your sales price. If you spent $15,000 on a new kitchen, that renovation likely won't boost your home's final sales price by $15,000. Buyers will still pay what your home is worth in today's market, no matter how much you improve it. 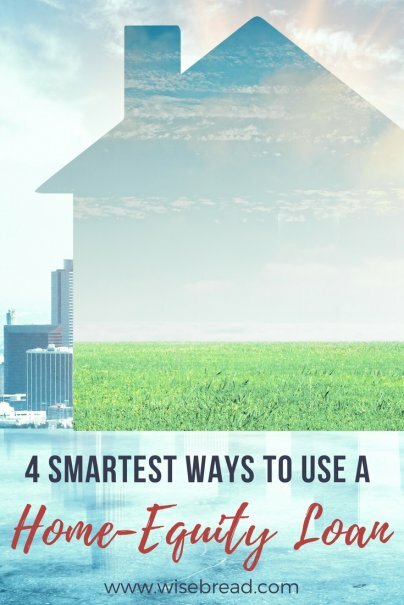 But if you are using your renovations either for your own enjoyment or to increase the number of buyers who will be interested in your home, using a home-equity loan makes sense. Remember, though, if you plan to sell your home before you pay off your loan or line of credit, you'll have to use the profits from your home sale to not only pay off your primary mortgage, but also your loan. That will eat into the money you take away from your sale. Borrowing from your home equity comes with far lower interest rates than credit card debt. While credit card interest rates can reach 20 percent or more, home equity loans have rates that typically fall somewhere between 4 and 5 percent, depending on the terms. It makes financial sense to take out one of the lower-rate loans and use the money to pay off credit cards. There are caveats, though. Credit card debt is unsecured debt. If you can't afford to make your monthly payments, you won't lose your home because of it. The same isn't true of home equity loans. If you can't afford your monthly payments with these loans, you could lose your home. So only take out a home-equity loan for credit card debt if you're absolutely sure you can afford the monthly payments. A home-equity loan can help you pay for a child's college education. And it might be a more attractive option for parents than taking out a private loan or a federal PLUS student loan that could come with high interest rates. Be careful, though: You don't want to sacrifice your own retirement to fund your child's college education. If taking out a loan to help your children pay tuition will make it impossible for you to save enough for your own retirement, don't take out any loan, including a home-equity loan. Your children do have options for paying for college, from taking out their own student loans to attending more affordable universities. If you've always wanted to invest more in the stock market, a home-equity loan can help. Say you borrow money from your equity at an interest rate of 4.25 percent, and you use these dollars to invest. If your investment yields a conservative return of 8 percent, you'll have made a solid chunk of money. Of course, there are risks. There is never any guarantee that your investment will increase in value, and you could even realize a loss. But if you are willing to take on this risk, and you can afford a possible loss, then investing home equity dollars into the market could make you wealthier.